A newly-formalized collaborative effort between Brazil’s law enforcement agencies and forest communities has ambitious plans to unravel an entire criminal enterprise operating in western Pará. Steve Schwartzman of the Environmental Defense Fund says such collaborative efforts can have a huge impact on curbing illegal deforestation and illegal logging. Originally posted on the Environmental Defense Fund. 13 July 2016 | A new operation against land grabbers and illegal loggers in Brazil’s state of Pará is showing how collaboration between indigenous and forest communities and law enforcement can take on the biggest ongoing threats to the Amazon forest: illegal logging and illegal deforestation for land grabbing. Launched June 30th, the operation started with an investigation two years ago after leaders from the Kayapô indigenous group reported clandestine deforestation on the western border of their territory to the Brazilian federal environmental enforcement agency, IBAMA. Guided by the Indians, IBAMA agents discovered encampments of workers who were clearing the forest in the indigenous territory and on adjacent public land, while leaving the tallest trees; this hid the illegal deforestation from satellite monitoring. The workers, who according to police labored under semi-slave conditions, would then burn the understory and plant pasture grass. Meanwhile, another part of the gang surveyed and forged land registry documents to sell the land. IBAMA agents shut down the camps, detained personnel and issued fines – and brought in the Prosecutor’s Office and Federal Police to investigate. We can protect the Amazon from degradation and deforestation. Both problems have the same solution. That investigation led to an impressive 24 arrest warrants, nine subpoenas, and 18 orders for search and seizure, in five states, in what Federal Police, Prosecutor’s Office, Internal Revenue Service and IBAMA call the biggest illegal deforestation and landgrabbing mafia in the Amazon. Several of the gang’s leaders have already been imprisoned and face tens of millions of dollars in fines – as well as, potentially, stiff jail sentences. The gang’s operation shows how the illegal value chains work. First, the operators deploy semi-slave labor to invade reserves or occupy public land not designated for any particular use. They extract the highest-value hardwoods, then slash and burn the forest, and plant pasture. Meanwhile higher-up gang members draw up fraudulent documentation and sell the land to investors. The bosses of this high-tech organized crime enterprise run the “ranches,” coordinate a marketing group, hire surveyors and remote sensing specialists, and use family networks to launder illegal revenue. Prosecutors estimate that the group had revenues of almost $600 million between 2012—2015. Organized criminal enterprises like this one are behind most if not all of the high-value illegal activities in the Amazon frontier zone – illegal logging, use of semi-slave labor, illegal deforestation for land grabbing and fraudulent sales, and tax evasion in the approximately 30% of the region under near-term threat of destruction or degradation. Taking down a gang like the western Pará outfit is better than a two-for-one deal. The now-formalized program that just launched – a joint effort of Brazil’s Federal Police and the Federal Prosecutor’s Office – is called “Operation Flying Rivers,” after the huge quantities of water vapor the Amazon forest releases into the air, responsible for rainfall regimes as far away as California, which by some estimates approximates the volume of water flowing in the Amazon river. The program is a good example of how effective collaboration between local forest communities and government authorities can be. And “Flying Rivers” goes way beyond stopping a particular invasion here, or apprehending some timber there; it aims to take apart the command structure of an entire criminal enterprise with multiple illegal value chains extending over much of western Pará. This kind of persistent, integrated, multi-agency, enforcement campaign is central to addressing the real causes of continuing illegal deforestation and forest degradation, as well as land fraud – and critical to establishing the forest governance needed for long-term sustainable use of forests, including at-scale economic incentives for stopping legal deforestation and finance for eliminating illegal forest clearing through carbon markets and other sources. Brazil has made huge progress in reducing deforestation – but momentum has stalled. Since 2011, deforestation has been hovering around 5,000 km²/yr – not heading for zero, as an increasingly solid scientific consensus advises. This is way less than the 19,500 km²/yr average from 1996—2005, but still much too much. 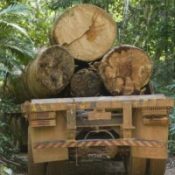 And, in lawless frontier regions, like southwestern Pará, illegal logging is degrading biodiversity and carbon stocks over vast areas. It is generally held that about 80% of Amazon timber is illegally extracted, with the lion’s share sold in Brazil. That is about the same proportion of the Amazon’s current deforestation estimated to be illegal. But you only have to look at the satellite photos to see why indigenous territories and other kinds of protected forest areas have been so important to Brazil’s success in reducing Amazon deforestation over 70% in the last decade, making it the world leader in reducing greenhouse gas pollution. 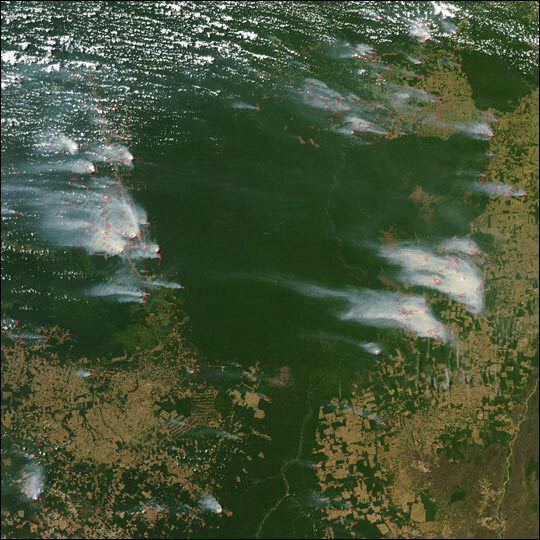 Kayapô, Panará indigenous territories and Xingu Indigenous Park (dark green), with fires and smoke plumes on their borders. Indigenous territories and protected areas are effective barriers to deforestation and fires. Photo: NOAA satellite. EDF’s partners in the Xingu River basin – indigenous and traditional forest communities, including the Kayapô and 17 other indigenous peoples – monitor and defend a continuous area of protected forest more than twice the size of New York state. They have mobilized a lot of successful enforcement operations to stop illegal logging and land grabbing, including the “Flying Rivers” program. This is why the law enforcement operation launched in Pará is so important and promising. We can look at it as a version of “bad money drives out good” – no legitimate forestry or agricultural enterprise can compete with unrestrained organized crime. “Flying Rivers” is an excellent example of what’s needed to level the playing field. We can protect the Amazon both from degradation and from deforestation. Both problems have the same solution. Steve Schwartzman is Senior Director of Tropical Forest Policy at Environmental Defense Fund.